I interviewed Rebecca by sending her some questions through email. I am including the questions as well as the answers for you to enjoy. My questions are in bold and her anwers are in italics. I really appreciate Rebecca allowing me to interview her. Thanks, Rebecca! Oh, by the way, Rebecca is only 14. She turned 14 in March, so she was only 13 when she did the two pieces above. Rebecca, could you tell us a little about your art background, such as how long have you been creating art, etc. I’ve always drawn, but I started lessons when I was eleven. What was the inspiration for your beautiful watercolor titled, “Bazaar”? I had several photographs of a local shopping area. I liked that one because all of the little details. Do you use photographs as reference for a drawing or painting? I sketch it with pencil. What are your favorite art supplies you could not do without? I’m pretty good at making do with what I have. How often do you draw or paint in a month? I draw or paint for hours every day. When you do a drawing such as “Zoe”, how do you get the feeling of depth? I use lots of shading. Have you always been interested in creating art? Is there someone in particular that encouraged you to create art? Or did you have this desire on your own? I’ve always been interested. I don’t remember a beginning to it. 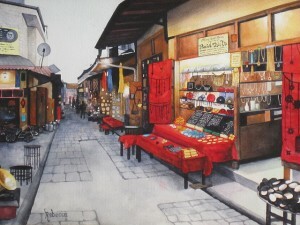 Can you tell us some of the techniques you use when creating a painting such as “Bazaar”? I used super tiny brushes to make the details. Where do you work on your art? Do you have a space designated just for your art work? I work mostly in our living room. Right now I’m working on a painting in our kitchen. What are you working on right now? How many pieces of art work do you work on at the same time? Do you sell your work? I’m working on a still life painting, a pencil portrait drawing, a landscape painting, a pastel drawing and a colored pencil drawing. I often am working on about five things at a time. I have sold some artwork. 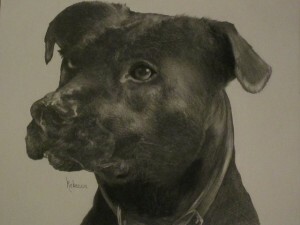 I take pencil portrait orders and offer prints of some things on Fine Art America, http://fineartamerica.com/art/all/rebecca+giles/all. Rebecca’s answer about how often she works on her art work is impressive. She said hours every day. I found out through Rebecca’s mother, Lee, that Rebecca works 5 to 6 hours every day on her art. Lee said, “That is what homeschooling affords her. She loves art, so she spends a lot of time on it. It’s talent and passion combined that makes her work really special.” We all know that in order to get good at something you have to practice. Rebecca’s practice has paid off. Rebecca also has a new store at http://rebeccagilesart.storenvy.com. I hope some of you will take a moment to look at her work. You can use the links above.